We’ve known for years that bike share isn’t living up to its potential to serve all residents, but now the most rigorous study of equity and bike sharing shows why that might be happening. 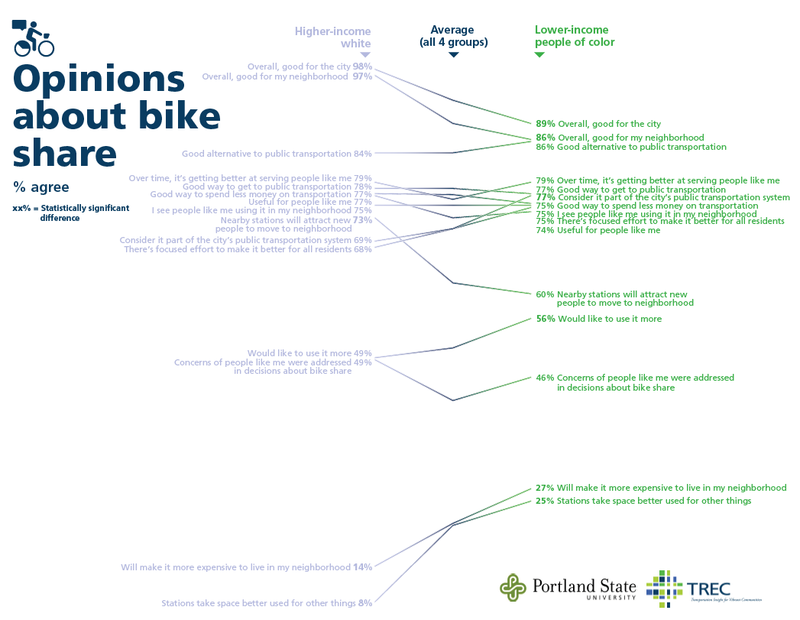 The study was conducted by Portland State University’s Transportation Research and Education Center. Researchers mailed 18,000 surveys about bicycling and bike share to residents in Philadelphia, Chicago, and Brooklyn. 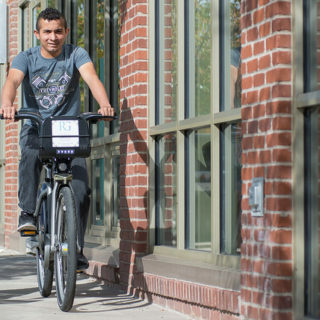 All three locations have well-established bike share systems, including provisions for low-income residents. The respondents to the survey were fairly representative of the Census statistics for each neighborhood studied. Additionally, the data was fairly consistent across the three cities in what it showed about barriers and opportunities for increased bike share use. Bike share is uniquely poised to address some of residents’ biggest mobility needs — even better, in some cases, than standard bicycles. 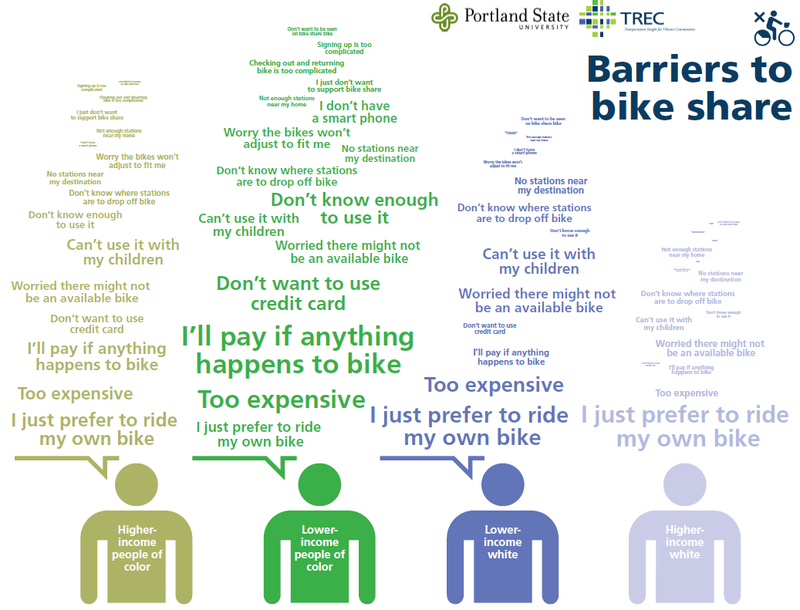 A full quarter of survey respondents said that not having a safe place to store a bike at home was a “big barrier” to bicycling more, and those who were low-income were more likely to say that this was true for them. 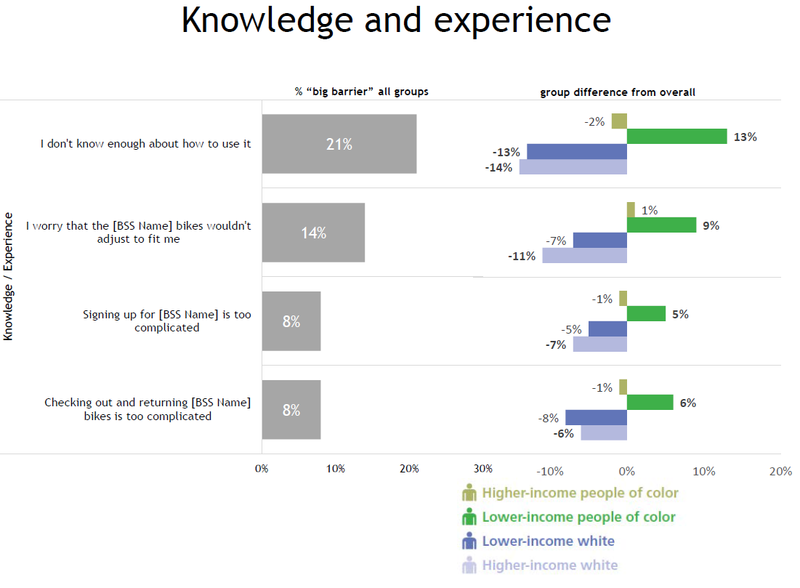 Additionally, not having a bike or related gear, or the cost of purchasing such items, was perceived as a big barrier to more individuals within the low-income people of color group. Since bike sharing doesn’t require actual ownership of a bike, equipment for maintenance, nor a storage space within the home, it is uniquely poised to address some of these concerns that are larger barriers for the study’s target population. 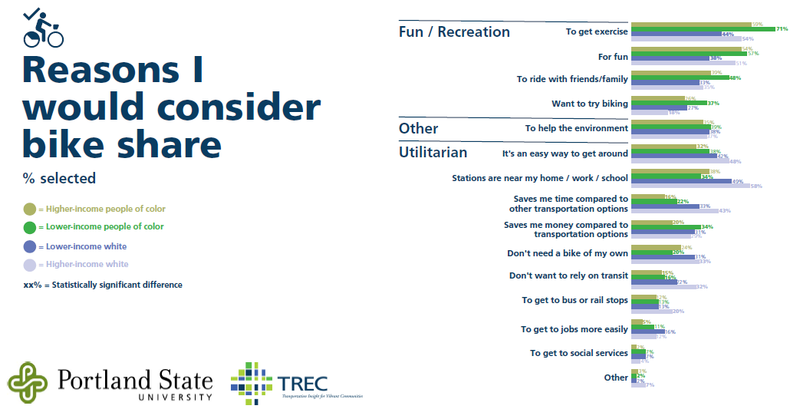 Another reason bike share has the potential to be an important resource for low-income residents of color is that such individuals are less likely to have a car available for use, and more likely to use transit in comparison to others. One of bike share’s strengths is that it can make it easier to get to and from a transit station. Source: Portland State University TREC center. Low-income people of color are included in that figure, though they were comparatively less likely to want to ride more or plan to ride more in the next year. 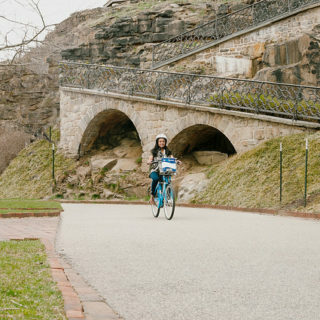 It’s possible that creating more of a connection to bike share could bridge that gap in plans and interest. 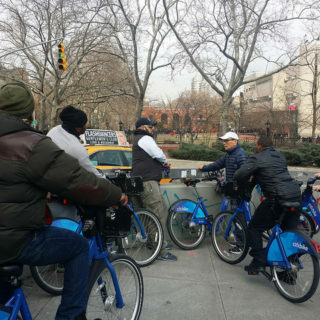 Overall, bike share is not currently a frequent travel mode among most residents, including low-income people of color, but such individuals are open to the idea of using it more, particularly for its exercise and fun aspects. Nevertheless, very real challenges to accessing bike share persist, particularly for low-income people of color. Many individuals don’t have correct knowledge of how bike share function and what is required to use it, a result consistent with findings by researcher Charles Brown. “63% respondents did not know whether there was a discounted pass,” said McNeil. 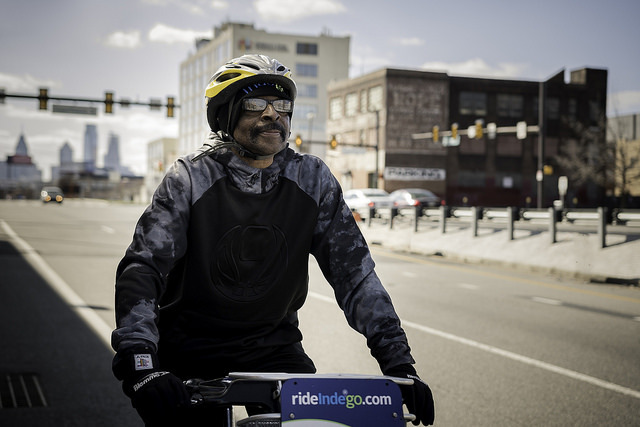 “There was often the incorrect assumption that a helmet is required, or that the bike would lock if they exceeded a time limit.” Particularly among low-income people of color, residents often indicated “I don’t know enough about it,” when asked about what bike share entails. We’ll cover more about the perceived cost and liability concerns that impact intention to use bike share in a later post in this series. It’s important to remember that social factors have a lot to do with whether residents adopt bike share, particularly residents of color. 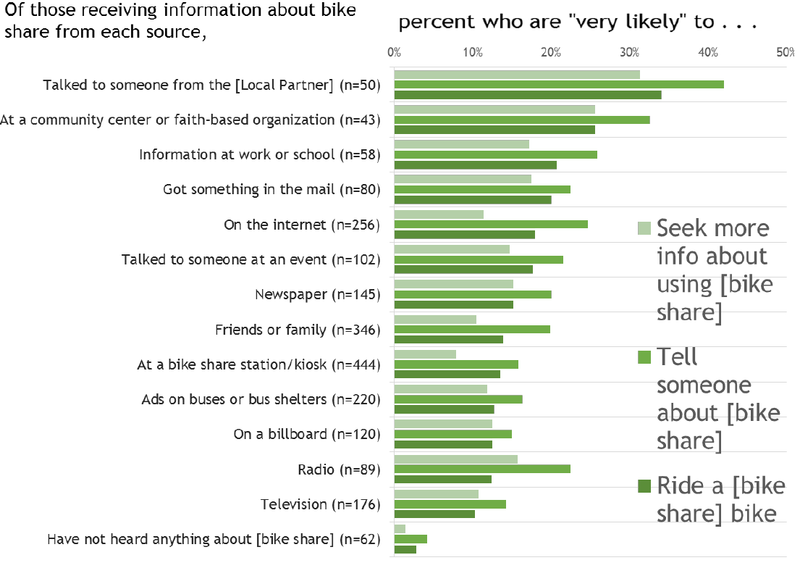 He notes that in particular, those who had spoken with someone at a local community center or bike share center were much more likely to tell the researchers that they actually intended to use bike share. The results are consistent with other studies that show social factors and family as a strong pull toward biking among Latino residents. In following posts, we’ll cover the recurring issue of traffic safety, concerns over perceived bike share cost and liability, and the questions that remain to be answered by future bike share research.